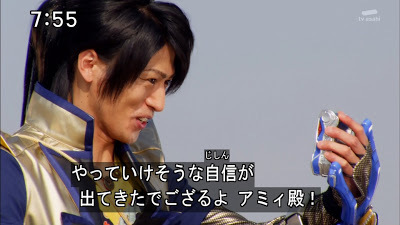 Zyuden Sentai Kyoryuger episode 12: Attack! The King and I "Buttobasso! Sessha to Kingu-dono" (ブットバッソ！せっしゃとキングどの). Here is a preview of this episode. While cheering on young boy Tsuyoshi at a Children's Day sumo tournament, Debo Tangosekku attacks, and during the attack, Utsusemimaru sees someone from his past in Tsuyoshi's actions.